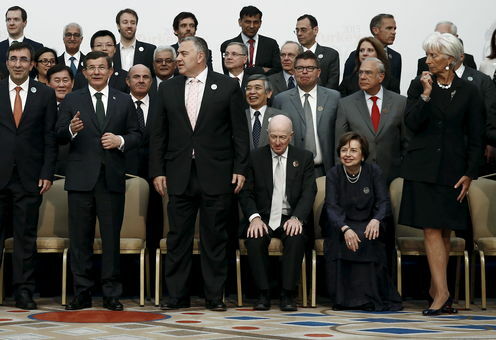 G20 finance ministers met in Turkey on the weekend, where they admitted global growth had fallen short of their expectations. The host is keen to shake off perceptions that these meetings are just a talkfest. The problem is they are. If you happened to be paying attention last year, Joe Hockey came up with the unverifiable plan to “lift our collective GDP by more than 2% by 2018 above the trajectory implied by policies in place … in 2013". The focus of that summit was on reforms and infrastructure spending across the G20 to raise growth. The problem is that most advanced economies have problems with public debt that make significant increases in infrastructure spending unaffordable. Australia has enough problems enacting reforms to product and labour markets, but in other advanced economies with even worse structural problems the difficulties seem to be greater. Prime Minister Shinzo Abe in Japan has not been able to make progress on any significant structural reforms in that economy, even though these reforms are critical in getting Japan out of its long secular decline. European economies have similar problems, but in many cases these economies are going backwards rather than forwards. Even Germany has cut the retirement age, which is at odds with efforts to raise participation and deal with rising pension costs. Since the G20 meeting last year economic growth has slowed everywhere. Global growth slowed in the first half of 2015, with manufacturing, investment and trade all weak. A key problem is weakness in business investment and, as a recent Bank for International Settlements report makes clear, the problem is uncertainty about the future state of the economy and profitability. Business investment is a key indicator of expectations about future growth, and businesses are telling us that they don’t expect to see growth enhancing reforms any time soon. This is wishful thinking. Without reform and without business investment, growth will continue to be weak. The IMF is concerned about slowing emerging market growth, but the reality is that the real drag on the global economy is the major advanced economies in Europe, Japan and also the United States. It is in these countries where the need for reform is the greatest, but the progress is nowhere to be seen. G20 meetings probably do no harm, but they don’t seem to do much good either. For Australia the issue is to make progress on our own structural reforms, infrastructure bottlenecks, tax and spending problems. Dealing with these issues is a priority irrespective of what other G20 countries do. Having pledged to raise global growth last year, Joe Hockey delivered a “boring” budget in 2015 that did nothing to raise Australia’s growth, or address any of these issues. But we could say the same about most of the other 19 G20 countries.